Can ALL of your customers read your menu? Business card? Brochure? Alternative Formats for Everyone offers a variety of opportunities for businesses to provide their customers with materials in accessible formats such as braille, large print and audio. Compliance with ADA regulations is beneficial because access for everyone is the key to attracting new customers and retaining those you already serve. 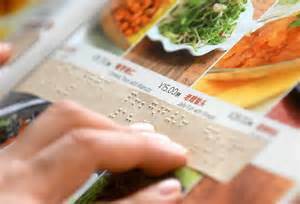 What’s more, compliance is surprisingly affordable, and greatly appreciated by your customers with visual impairments. No job is too large or too small. Contact us today for more information and a price quote. (912) 920-2414.